Most of the agriculture in the Ethiopian part of the Nile Basin is rain-fed. Its low productivity can be explained to a large extent by the lack of appropriate rainwater management. Promoting rainwater management practices in Ethiopia is not new, but most have been promoted regardless of the bio-physical and socio-economic context and without considering local expertise. This poster, prepared for the ILRI@40 series of events, gives an overview of efforts to improve rainwater management in Ethiopia using the Nile-Goblet tool in the Nile Basin Development Challenge (NBDC) project. Visit ilri.org/40 for more information. Small-scale farmers face numerous challenges to invest in natural resource management practices. The problems are interlinked, with such perverse economic problems as high transaction costs and risk rooted in the lack of comprehensive institutional and organizational services to farmers for risk reduction and incentive creation. Failure to address such a missing link undermines success in natural resource management. This paper ponders the importance of such a missing link and proposes an analytic framework that explicitly integrates the economics of natural resource management into institutional and organizational analysis. The framework features the instrumentality of integrated institutional and organizational innovation to create opportunities and incentives to small-scale farmers to encourage investment in natural resource management practices. Innovation systems thinking is increasingly influencing approaches to sustainable agricultural development in developing world contexts. This represents a shift away from technology transfer towards recognition that agricultural change entails complex interactions among multiple actors and a range of technical, social and institutional factors. One option for practically applying innovation systems thinking involves the establishment of innovation platforms (IPs). Such platforms are designed to bring together a variety of different stakeholders to exchange knowledge and resources and take action to solve common problems. Yet relatively little is known about how IPs operate in practice, particularly how power dynamics influence platform processes. This paper focuses on a research-for-development project in the Ethiopian highlands which established three IPs for improved natural resource management. The ‘power cube’ is used to retrospectively analyse the spaces, forms and levels of power within these platforms and the impact on platform processes and resulting interventions. The overall aim is to highlight the importance of power issues in order to better assess the strengths and limitations of IPs as a model for inclusive innovation. 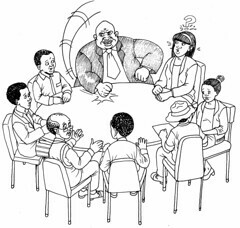 Findings suggest that while IPs may achieve some short-term success in creating spaces for wider participation in decision-making processes, they may be significantly influenced by forms of power which may not always be visible or easily challenged. 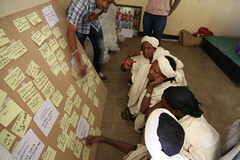 Activities conducted as part of NBDC innovation platform work in Fogera (photo credit: ILRI/Apollo Habtamu). This paper draws lessons from two years of work with ‘innovation platforms’ that were established by the Nile Basin Development Challenge (NBDC) program in an attempt to strengthen landscape-level rainwater management in Ethiopia. The NDBC’s work included the use of an innovation fund to support pilot interventions. This paper particularly reviews questions of political economy and equity in platform activities and examines decision-making processes, the roles and level of influence of different platform members, the nature of platform-community relations and the extent to which different groups are benefiting. The information presented in this working paper was gathered from a mixture of sources: interviews conducted with platform members; observation of meetings and activities by NBDC staff; official minutes of platform meetings and other associated events (e.g. training sessions) and informal discussions between NBDC staff and platform members. This paper is the latest of a ‘research for development (R4D)’ series of working papers developed by the Challenge Program for Water and Food (CPWF). Read the working paper ‘Innovation Platforms to Enhance Participation in Rainwater Management: Lessons from The Nile Basin Development Challenge with a Particular Focus on Political Economy and Equity Issues‘. Discover the rest of the CPWF’s R4D working paper series. Fogera Woreda is one of the three “Research for Development” intervention sites for the Nile Basin Development Challenge (NBDC) project. A local Innovation Platform (IP) was established to bring different stakeholders together for knowledge sharing, joint planning and implementation of development intervention. The IP was used as an instrument to identify and prioritize major Natural resource Management (NRM) challenges through a participatory multi-stakeholder process. Free grazing emerged as a key NRM challenge and fodder development interventions were proposed as an entry point to tackle the problem of land degradation and animal feed shortage in the area. In 2012 the fodder intervention was piloted at Gebere-Gesa village, in Wej-Awramba Kebele, after a baseline assessment was carried out by IP Technical Group (TG) members. In the village a total of 20 farmers were involved in the fodder development intervention. Farmers sowed and planted improved fodder species on the communal grazing land and backyard to deal with the problem. Different fodder species mainly Sesbania, Vetivar, Elephant grass, Cow pea and Pigeon Pea were introduced. All of the farmers showed interest in the intervention as they have serious livestock feed shortage and have witnessed how their communal land biomass production is decreasing over the years. Even though the intervention went well initially and the IP was successful in introducing the fodder, it was not able to proceed as planned on the communal grazing land as farmers started uprooting the plants. The community was fearful of losing the communal grazing land which is also a place for important social events and religious festivals. Farmers had recently experienced government-led NRM interventions where degraded steep slopes were enclosed for rehabilitation, to be only used for bee keeping by the village youth. Farmers were not happy as they thought it limited their access to the resources and ruled out their sense of ownership. When the new fodder intervention on the communal grazing land was brought by TG members, they thought the government might be “planning” again to claim their communal land despite the challenges they are facing. Being relatively new to community engagement the members of the IP technical group were not able to introduce an adequate and carefully facilitated process to build trust and ensure an effective dialogue. According to a Woreda expert, lack of follow up and consultation has boosted farmers’ skepticism about new interventions. This time Gebere Gesa farmers are trying the fodder development in their backyards and are willing to scale it up if they have better access to fodder seed and seedlings. Thus, IP members shifted their intervention site to Gunguf Village where previous fodder development activities had started on communal grazing land (size of 1.5 ha) owned by 13 farmers with support from a development agent. This intervention was successful as the farmers already agreed among themselves and were ready to accept the intervention plan with full confidence. These farmers were relatively better suited for the intervention than the farmers in Gebere-Gesa, since they had large-sized communal grazing land and each farmer also owned private grazing land. The TG members have been backstopping the farmers with training and input supply from the Innovation Fund of the Challenge Program for Water and Food to start over-sowing different improved fodder species in the communal land and backyards. Farmers developed bylaws to protect the communal land and were able to harvest a good amount of fodder and shared it equally among themselves. This intervention also addressed equity issue among the farmers: Birke is heading a household without livestock but she has benefited from the sales of fodder that she shared from the communal land. Farmers were happy to continue developing fodder for the seasons to come and decided to allocate land for the establishment of a nursery site to increase the supply of improved fodder species seeds in their vicinity. In 2013 the IP agreed to continue supporting the Gunguf farmers and added a new site called Chebi village. An estimated 200 m2 forage nursery site was established in Gunguf to be used as a seed/seedling source. This time, 58 farmers from both villages were involved in the fodder development intervention. Drawing upon lessons from Gebere Gesa the IP members saw to a better consultation process with farmers, whereby a portion of the communal grazing land was used for the intervention leaving the rest for important social events. In Gunguf, farmers witnessed the benefits of the intervention. Yeshi, a female farmer, explained how the new fodder intervention had helped improve her daily milk production from 1 liter to 2.5 liters per cow. All households in the village are now feeding their animals using cut-and-carry fodder from their communal land and backyards. Most farmers in Gunguf are now stall-feeding their livestock in the dry season and only let them out in June, when all stored feed is depleted. A few farmers even traded their crop land for fodder and leased plots from other nearby farmers to cultivate food crops. Stall-feeding has another advantage for them: the farmers are now able to send their children to school, while before they would have spent their time on the field with the animals. 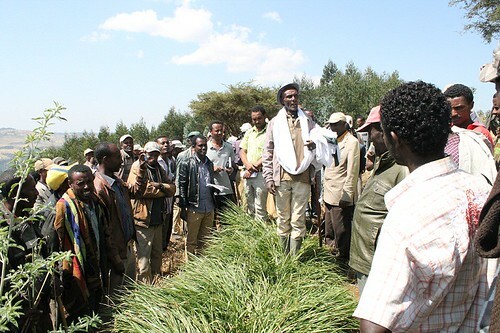 Training was given in 2012 on forage development and urea treatment and an experience visit was organized at Gunguf where farmers from eight Kebeles participated and shared lessons learned from the Gunguf experience. Woreda experts have a positive attitude vis-à-vis the NBDC intervention where integrated rainwater management approaches are combined options. This intervention gave farmers access to enough alternative animal feed sources while at the same time helping to rehabilitate the natural resource base. For a researcher from Bahir Dar University, this was one of the main reasons why previous fodder intervention focusing only on rehabilitation of communal grazing land failed. The eighth key message from the Nile Basin Development Challenge is to ‘improve markets, value chains and multi-stakeholder processes to enhance benefits and sustainability of interventions’. It proposes to enhance market benefits of soil and water conservation interventions by e.g. planting forages creating bio-mass and feeding livestock, leading to further benefits further down the line.